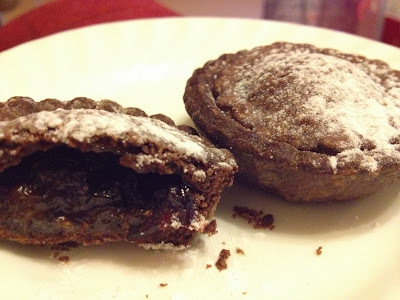 I know I am rather late posting this recipe, it's now New Years Eve! To top it off it is also supposed to be an entry into December's We Should Cocoa Challenge, but I have kind of missed that too. Preheat oven to 180 degrees c or gas 4. Rub the butter and flour together, until it resembles breadcrumbs. Sift the icing sugar and cocoa into the mixture, add the egg and salt. Mix altogether lightly to you obtain a smooth dough. You will need to chill the pastry for a minimum of 30 minutes, wrap in cling film and place in fridge. Roll out the pastry onto a floured surface, cut out using your pastry cutters and place into you pie trays. This should make a good 16 mince pies, but it will depend on how thick you like your pastry. Before adding your mincemeat straight to your pastry cases, pop it into a bowl and mix in 3 tablespoon of Port, or more but you do not want it too runny. Add a good teaspoon of the mincemeat into the pastry cases. Use a little milk to fix the pastry lids on. Bake in the oven for 15 mins. It is tricky to judge when chocolate pastry is baked, but I always say its better to have slightly over baked pastry than under baked. So if you are unsure bake for a few extra minutes. 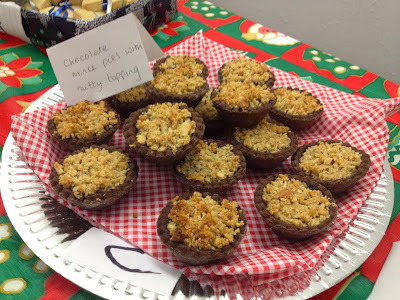 I baked some of these for my Christmas Office Bake Off, but finished them with a nutty topping. 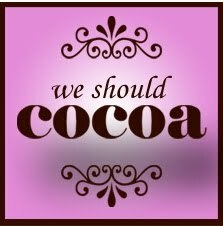 This is my late entry into December's We Should Cocoa Challenge, which this month combines chocolate with alcohol and is hosted by Chocolate Log Blog.